In Java, are there clear rules on when to use each of access modifiers, namely the default (package private), public, protected and private, while making class and interface and dealing with inheritance? The official tutorial may be of some use to you. Like you'd think, only the class in which it is declared can see it. Can only be seen and used by the package in which it was declared. This is the default in Java (which some see as a mistake). Package Private + can be seen by subclasses or package member. Visible outside the code I control. (While not Java syntax, it is important for this discussion). C++ defines an additional level called "friend" and the less you know about that the better. When should you use what? The whole idea is encapsulation to hide information. As much as possible you want to hide the detail of how something is done from your users. Why? Because then you can change them later and not break anybody's code. This lets you optimize, refactor, redesign and fix bugs without worry that someone was using that code you just overhauled. So, rule of thumb is to make things only as visible as they have to be. Start with private and only add more visibility as needed. Only make public that which is absolutely necessary for the user to know, every detail you make public cramps your ability to redesign the system. Personally, I stick with just "private" and "public". Many OO languages just have that. "Protected" can be handy, but it's really a cheat. Once an interface is more than private it's outside of your control and you have to go looking in other people's code to find uses. This is where the idea of "published" comes in. Changing an interface (refactoring it) requires that you find all the code which is using it and change that, too. If the interface is private, well no problem. If it's protected you have to go find all your subclasses. If it's public you have to go find all the code which uses your code. Sometimes this is possible, for example if you're working on corporate code that's for internal use only it doesn't matter if an interface is public. You can grab all the code out of the corporate repository. But if an interface is "published", if there is code using it outside your control, then you're hosed. You must support that interface or risk breaking code. Even protected interfaces can be considered published (which is why I don't bother with protected). Many languages find the hierarchical nature of public/protected/private to be too limiting and not in line with reality. To that end there is the concept of a trait class, but that's another show. A private member (i) is only accessible within the same class as it is declared. A member with no access modifier (j) is only accessible within classes in the same package. A protected member (k) is accessible within all classes in the same package and within subclasses in other packages. A public member (l) is accessible to all classes (unless it resides in a module that does not export the package it is declared in). Access modifiers is a tool to help you to prevent accidentally breaking encapsulation(*). Ask yourself if you intend the member to be something that's internal to the class, package, class hierarchy or not internal at all, and choose access level accordingly. A field long internalCounter should probably be private since it's mutable and an implementation detail. A class that should only be instantiated in a factory class (in the same package) should have a package restricted constructor, since it shouldn't be possible to call it directly from outside the package. An internal void beforeRender() method called right before rendering and used as a hook in subclasses should be protected. A void saveGame(File dst) method which is called from the GUI code should be public. (*) What is Encapsulation exactly? Easy rule. Start with declaring everything private. And then progress towards the public as the needs arise and design warrants it. When exposing members ask yourself if you are exposing representation choices or abstraction choices. The first is something you want to avoid as it will introduce too many dependencies on the actual representation rather than on its observable behavior. As a general rule I try to avoid overriding method implementations by subclassing; it's too easy to screw up the logic. Declare abstract protected methods if you intend for it to be overridden. Also, use the @Override annotation when overriding to keep things from breaking when you refactor. It's actually a bit more complicated than a simple grid shows. The grid tells you whether an access is allowed, but what exactly constitutes an access? Also, access levels interact with nested classes and inheritance in complex ways. The "default" access (specified by the absence of a keyword) is also called package-private. Exception: in an interface, no modifier means public access; modifiers other than public are forbidden. Enum constants are always public. Is an access to a member with this access specifier allowed? Member is private: Only if member is defined within the same class as calling code. Member is package private: Only if the calling code is within the member's immediately enclosing package. Member is protected: Same package, or if member is defined in a superclass of the class containing the calling code. Local variables and formal parameters cannot take access specifiers. Since they are inherently inaccessible to the outside according to scoping rules, they are effectively private. For classes in the top scope, only public and package-private are permitted. This design choice is presumably because protected and private would be redundant at the package level (there is no inheritance of packages). All the access specifiers are possible on class members (constructors, methods and static member functions, nested classes). You need access to a constructor to construct an object. Thus if all constructors are private, the class can only be constructed by code living within the class (typically static factory methods or static variable initializers). Similarly for package-private or protected constructors. You also have to consider nested scopes, such as inner classes. An example of the complexity is that inner classes have members, which themselves can take access modifiers. So you can have a private inner class with a public member; can the member be accessed? (See below.) The general rule is to look at scope and think recursively to see whether you can access each level. Java - Method accessibility inside package-private class? default (or package-private): package scope. protected: package scope + child (like package, but we can subclass it from different packages). The protected modifier always keeps the "parent-child" relationship. (D)irect (invoke from a method inside the same class). (R)eference (invoke a method using a reference to the class, or via "dot" syntax). protected: accessible by the classes of the same package and the subclasses residing in any package. default (no modifier specified): accessible by the classes of the same package. private: accessible within the same class only. Let's add a protected method foo() to Father. The following situations are not valid. Methods, Variables and Constructors that are declared private can only be accessed within the declared class itself. Private access modifier is the most restrictive access level. Class and interfaces cannot be private. Variables that are declared private can be accessed outside the class if public getter methods are present in the class. Variables, methods and constructors which are declared protected in a superclass can be accessed only by the subclasses in other package or any class within the package of the protected members' class. The protected access modifier cannot be applied to class and interfaces. Methods, fields can be declared protected, however methods and fields in a interface cannot be declared protected. Protected access gives the subclass a chance to use the helper method or variable, while preventing a nonrelated class from trying to use it. A class, method, constructor, interface etc declared public can be accessed from any other class. Therefore fields, methods, blocks declared inside a public class can be accessed from any class belonging to the Java Universe. However if the public class we are trying to access is in a different package, then the public class still need to be imported. Because of class inheritance, all public methods and variables of a class are inherited by its subclasses. Default access modifier means we do not explicitly declare an access modifier for a class, field, method, etc. A variable or method declared without any access control modifier is available to any other class in the same package. The fields in an interface are implicitly public static final and the methods in an interface are by default public. We cannot Override the Static fields.if you try to override it does not show any error but it doesnot work what we except. Public: Accessible to class, package (all), and subclasses... In short, everywhere. The difference can be found in the links already provided but which one to use usually comes down to the "Principle of Least Knowledge". Only allow the least visibility that is needed. Access modifiers are there to restrict access at several levels. Public: It is basically as simple as you can access from any class whether that is in same package or not. To access if you are in same package you can access directly, but if you are in another package then you can create an object of the class. Default: It is accessible in the same package from any of the class of package. To access you can create an object of the class. But you can not access this variable outside of the package. 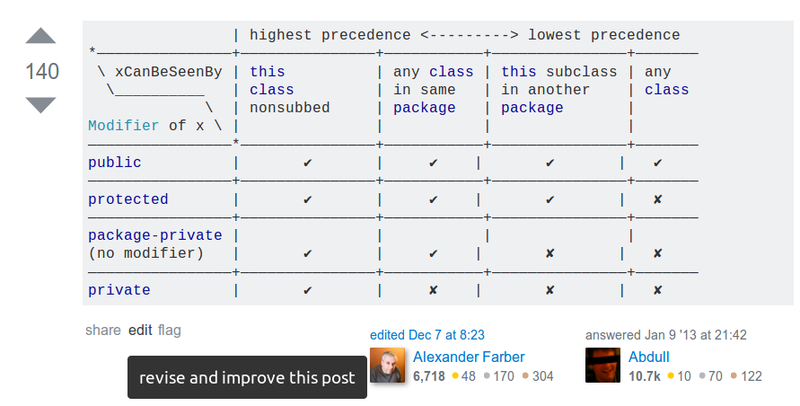 Protected: you can access variables in same package as well as subclass in any other package. so basically it is default + Inherited behavior. To access protected field defined in base class you can create object of child class. Private: it can be access in same class. In non-static methods you can access directly because of this reference (also in constructors)but to access in static methods you need to create object of the class. Java access modifiers are used to provide access control in Java. Accessible to the classes in the same package only. This access is more restricted than public and protected, but less restricted than private. Accessible only inside the same class. I just want to address a detail that is extremely commonly got wrong, including by most of the answers on this page. "Default" access (when no access modifier is present) is not always the same as package-private. It depends on what the thing is. public - accessible from anywhere in the application. default - accessible from package. private - accessible from its class only. Visible to the package. The default. No modifiers are needed. Visible to the class only (private). Visible to the world (public). Visible to the package and all subclasses (protected). Methods, variables and constructors that are declared private can only be accessed within the declared class itself. The private access modifier is the most restrictive access level. Class and interfaces cannot be private. Variables that are declared private can be accessed outside the class if public getter methods are present in the class. Using the private modifier is the main way that an object encapsulates itself and hides data from the outside world. A class, method, constructor, interface, etc. declared public can be accessed from any other class. Therefore fields, methods, blocks declared inside a public class can be accessed from any class belonging to the Java universe. However, if the public class we are trying to access is in a different package, then the public class still need to be imported. Variables, methods and constructors which are declared protected in a superclass can be accessed only by the subclasses in another package or any class within the package of the protected members' class. The protected access modifier cannot be applied to class and interfaces. Methods, fields can be declared protected, however methods and fields in a interface cannot be declared protected. .... Protected: Protected access modifier is the a little tricky and you can say is a superset of the default access modifier. Protected members are same as the default members as far as the access in the same package is concerned. The difference is that, the protected members are also accessible to the subclasses of the class in which the member is declared which are outside the package in which the parent class is present. David's answer provides the meaning of each access modifier. As for when to use each, I'd suggest making public all classes and the methods of each class that are meant for external use (its API), and everything else private. Over time you'll develop a sense for when to make some classes package-private and when to declare certain methods protected for use in subclasses. Note: This is just a supplement for the accepted answer. This is related to Java Access Modifiers. The following table shows the access to members permitted by each modifier. The first data column indicates whether the class itself has access to the member defined by the access level. As you can see, a class always has access to its own members. The second column indicates whether classes in the same package as the class (regardless of their parentage) have access to the member. The third column indicates whether subclasses of the class declared outside this package have access to the member. The fourth column indicates whether all classes have access to the member. Access levels affect you in two ways. First, when you use classes that come from another source, such as the classes in the Java platform, access levels determine which members of those classes your own classes can use. Second, when you write a class, you need to decide what access level every member variable and every method in your class should have. Public Protected Default and private are access modifiers. They are meant for encapsulation, or hiding and showing contents of the class. Class members can be public, protected, default or private. Private is not accessible outside the class Default is accessible only in the package. Protected in package as well as any class which extends it. Public is open for all. Normally, member variables are defined private, but member methods are public. Let's assume that you're a student at a university and you have a friend who's coming to visit you over the weekend. Suppose there exists a big statue of the university's founder in the middle of the campus. When you bring him to the campus, the first thing that you and your friend sees is this statue. This means that anyone who walks in the campus can look at the statue without the university's permission. This makes the statue as PUBLIC. Next, you want to take your friend to your dorm, but for that you need to register him as a visitor. This means that he gets an access pass (which is the same as yours) to get into various buildings on campus. This would make his access card as PROTECTED. Your friend wants to login to the campus WiFi but doesn't have the any credentials to do so. The only way he can get online is if you share your login with him. (Remember, every student who goes to the university also possesses these login credentials). This would make your login credentials as NO MODIFIER. Finally, your friend wants to read your progress report for the semester which is posted on the website. However, every student has their own personal login to access this section of the campus website. This would make these credentials as PRIVATE. default --> No access modifier keyword is present. This means it is available strictly within the package of the class. Nowhere outside that package it can be accessed. protected --> Slightly less stricter than default and apart from the same package classes it can be accessed by sub classes outside the package it is declared. It is all about encapsulation (or as Joe Phillips stated, least knowledge). Start with the most restrictive (private) and see if you need less restrictive modifiers later on. We all use method and member modifiers like private, public, ... but one thing too few developers do is use packages to organize code logically. For example: You may put sensitive security methods in a 'security' package. Then put a public class which accesses some of the security related code in this package but keep other security classes package private. Thus other developers will only be able to use the publicly available class from outside of this package (unless they change the modifier). This is not a security feature, but will guide usage. Another thing is that classes which depend a lot on each other may end up in the same package and could eventually be refactored or merged if the dependency is too strong. If on the contrary you set everything as public it will not be clear what should or should not be accessed, which may lead to writing a lot of javadoc (which does not enforce anything via the compiler...). Not the answer you're looking for? Browse other questions tagged java private public protected access-modifiers or ask your own question. difference between protected and package-private access modifiers in Java? Why can't I use protected constructors outside the package? What's the difference between ConcurrentHashMap and Collections.synchronizedMap(Map)? How should I have explained the difference between an Interface and an Abstract class?